In these bright, colorful pages, Joy shares how you can drop the calories in your most fattening favorites—withoutcompromising flavor. With a few simple tricks, she transforms a bacon cheeseburger from a whopping 1,100 calories to a mere 425 . . . and General Tso’s Chicken from an alarming 1,000 to a slimming 260. 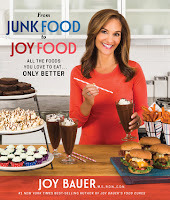 From Boston cream pie to spaghetti and meatballs, mint chocolate chip ice cream to Buffalo wings with creamy bleu cheese dip, Joy takes the most decadent treats from fat to fit. Want to give a BLT some TLC? Joy’s take on this classic comfort food could save you 35,000 calories annually—with the potential to drop 10 pounds! Featuring more than 120 recipes and oodles of gorgeous photos, From Junk Food to Joy Food has you covered from sun up to late night: breakfasts, dips, soups, sides, suppers, pizzas, pastas, desserts, mocktails, and more. Don’t deny yourself the flavors you love—learn to make them with joy!